Musk MallowDeciduous perennial. Forms a bushy mound of deeply dissected leaves with a pleasant musky..
Black ParsleyEvergreen perennial. Large, lush, green leaves grow into a giant rosette atop a slender..
IceplantEvergreen perennial. Hardy succulent makes low mats of small green fleshy foliage. Covered w..
Chocolate MintSemi-evergreen perennial. Evergreen in mild winters. Can be an aggressive spreader, be..
PeppermintSemi-evergreen perennial. Evergreen in mild winters. Can be an aggressive spreader, best k..
Orange or Bergamont MintSemi-evergreen perennial. Evergreen in mild winters. Can be an aggressive sp..
SpearmintSemi-evergreen perennial. Evergreen in mild winters. Can be an aggressive spreader, best ke..
Monkey FlowerEvergreen perennial. Dark red tubular flowers start in summer. Dark green, narrow and g..
Monkey FlowerEvergreen perennial. Yellow, tubular flowers start in summer. Dark green, narrow and gl..
Monkey FlowerEvergreen perennial. Reddish-orange, tubular flowers peak bloom in summer. Dark green, ..
Monkey FlowerEvergreen perennial. 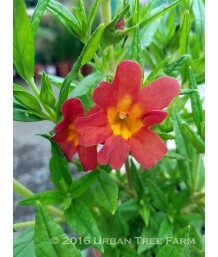 Red to orange, tubular flowers peak bloom in summer. Dark green, n..
Monkey FlowerEvergreen perennial. Burgundy, tubular flowers peak bloom in summer. Dark green, narrow..
Monkey FlowerEvergreen perennial. California native hybrid. Narrow glossy green leaves grow into a l..
Monkey FlowerEvergreen perennial. Magenta, tubular flowers peak bloom in summer. Dark green, narrow ..
Monkey FlowerEvergreen perennial. Red, tubular flowers peak bloom in summer. Dark green, narrow and ..
Monkey FlowerEvergreen perennial. Tubular flowers are yellow with white frilled edges and reach peak..
Monkey FlowerEvergreen perennial. Pale yellow flowers start in summer. Dark green, narrow and glossy..
Monkey FlowerEvergreen perennial. California native. Narrow glossy green leaves grow into a low moun..
Monkey FlowerEvergreen perennial. 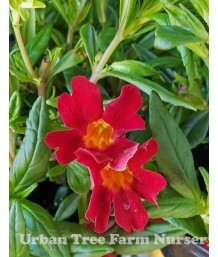 Brick red to orange, tubular flowers peak bloom in summer. Dark gr..
Bee Balm, Oswego TeaDeciduous perennial. Attracts bees, butterflies, and hummingbirds. Aromatic deep.. Dwarf Bee Balm, Oswego TeaDeciduous perennial. Attracts bees, butterflies, and hummingbirds. Aromati..
Bee Balm, Oswego TeaDeciduous perennial. Attracts bees, butterflies, and hummingbirds. Aromatic gree..
Scarlet Monardella CA nativeSemi-evergreen perennial. California native. Attracts bees, butterflies,..
California Native Coyote MintEvergreen perennial. California native hybrid. Aromatic grey-green leav..
Coyote Mint CA nativeSemi-evergreen perennial. California native. Attracts bees, butterflies, and hu..
California Native Willowy MonardellaEvergreen perennial. California native hybrid. Aromatic willowy ..
Red-leafed MukdeniaDeciduous perennial. Bright green, almost tropical, palmate leaves grow in a heuc..
BananaEvergreen perennial in mild-climates. Will die to the ground in colder areas and come back in ..
Chinese Yellow BananaEvergreen perennial in mild climates. Upright paddle-like gray-green leaves. Di..